If you’re unlucky enough to use the eastern section of the M25 on a regular basis, you’ll be all too familiar with the Dartford Crossing charge. But for the rest of us - especially new drivers - it can cause a bit of a headache. Here we explain everything you need to know about the charge, including how to pay for it and what happens if you don’t. 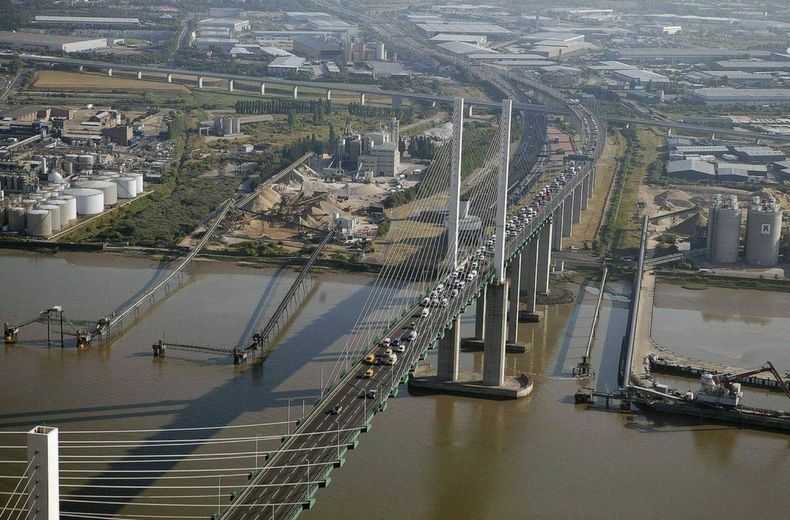 What is the Dartford Crossing charge/toll? The Dartford Crossing consists of two tunnels (carrying northbound traffic) and the Queen Elizabeth II bridge (carrying southbound traffic). The bridge was opened in 1991, a few years after the official opening of London’s M25 orbital motorway. Before then, all traffic went through the two tunnels - the first of which opened in 1963, at a cost of around £13 million. To fund the expense, motorists passing through the tunnel had to pay a toll - originally two shillings and sixpence. Increased traffic meant another tunnel was opened alongside the original in 1980, by which time 65,000 vehicles were passing through the two tunnels every day. Until 2014, drivers passing through the crossing (either through a tunnel or over a bridge) had to stop at a toll booth and pay the fee (by this time it was now £2 for cars). With 136,000 cars a day using the crossing, this could result in huge delays - particularly during rush hour and other peak times. A solution was introduced in November 2014. The new Dart Charge saw the toll booths being abolished, requiring drivers to go online or phone up to pay the toll. Automatic number plate recognition (ANPR) technology is used to police crossings. When do you have to pay it and how much is it? There are reductions available for regular users with prepaid accounts, while locals in cars or small commercial vehicles can get unlimited crossings for £20 a year, or £10 a year for 50 crossings. The charges for single journeys can be paid within 12 months in advance, or by midnight the day after you cross. The fees only apply between 6am and 10pm - if you cross overnight, you don’t have to pay. Do note, however, unlike London’s Congestion Charge, the Dart Charge applies seven days a week, including Christmas Day and other bank holidays. The easiest way to pay the Dart Charge is online, using the official website https://www.gov.uk/pay-dartford-crossing-charge. This accepts payments using debit or credit card and can be done within a few minutes. Alternatively, phone the Dart Charge hotline on 0300 300 0120 between 5am and midnight, or send advance payment in the post to: Dart Charge Customer Services PO Box 842 Leeds LS1 9QF. Is there any way to avoid payment? The only way to legally avoid payment is to travel over the crossing between the hours of 10pm and 6am, when the Dart Charge doesn’t apply. Alternatively, if you’re on a long journey using the M25, it might make sense to use the western side of the motorway which avoids the crossing (e.g. if you’re travelling from the M1 to the M20). This does get congested, though - especially close to Heathrow, where the major M3, M4 and M40 motorways join the M25. Using the RAC route planner can give you an idea of what to expect during your journey. If you do go the eastern way, you’ll struggle to find an alternative crossing. There’s a foot ferry upstream between Tilbury and Gravesend, while heading into London the nearest crossing is the Woolwich ferry (which is free to use and open to cars). Alternatively, head a little further west and you’ll be able to use the Blackwall tunnel. If you use the Dartford Crossing and don’t pay the Dart Charge, you’ll be liable for a £70 penalty charge sent to the address your vehicle is registered to. This’ll halve if you pay it within 28 days, but increase to £105 if you don’t pay. You’ll also have to pay the original fee. If you feel that you’ve been unfairly fined, it is possible to appeal - and reports from 2015 suggest appeals have a fairly high success rate. As an automated system, the cameras might occasionally misread number plates. Some motorists have received warning letters telling them to pay the crossing fee within 14 days - but if you know you’re crossing, it’s safer to just pay up in advance. Yes - if you don’t have to pay road tax because you’re disabled, you don’t have to pay the Dart Charge either. If you have a blue badge but still pay road tax, you have to pay for the Dartford crossing too. Moped, motorbikes, trikes and quad bikes are also exempt. While cyclists aren’t allowed on the crossing, there are free shuttles for cyclists wanting to cross.